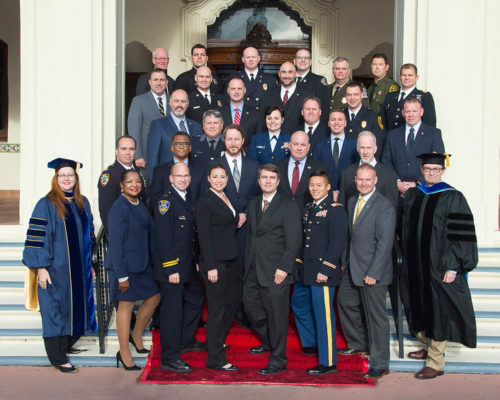 Graduation ceremonies at the Naval Postgraduate School on December 16 included 29 homeland security professionals who completed a Master of Arts in Security Studies from the NPS Center for Homeland Defense and Security. management, and the military (see attached list). The first program in the nation of its kind, CHDS provides a cutting-edge, multi-disciplinary curriculum in its 18-month master’s degree program in homeland security. Graduates are required to write theses pertinent to their employing agencies. • Outstanding Thesis Award: Marcus Sexton, Criminal Investigator, ICE, Homeland Security Investigations, San Antonio, for “Forecasting Our Adversaries’ Next Move: Trend Analysis and the Department of Homeland Security’s Role in the Development of Counter-Proliferation Intelligence.” The honor is based on overall academic rigor; quality of the literature review; impact of the study on homeland security strategy and future research implications; quality of analysis and conclusions; quality of organization, writing and overall presentation of thesis. • The Curtis “Butch” Straub Award: Brian Lee, Employment Services Bureau Commander , Phoenix Police Department, Phoenix. The Straub Award is based on grades, thesis and classroom leadership. The award is in memory of one of CHDS’ founders. • The Mark Carr Esprit De Corps Award: Pat Hensley, Captain, Daly City (California) Police Department and Jeff Siems, Fire Marshal, Edina (Minnesota) Fire Department. This award recognizes students whose actions instilled, sustained and created a spirit of unity and pride within the cohort. The Mark Carr Esprit De Corps Award and is named in honor of Mark Carr, a former CHDS student who died in August 2014. CHDS, located at the Naval Postgraduate School (NPS), is the nation’s homeland security educator. Master’s degree students develop critical thinking, leadership and policy skills during a rigorous 18-month program. Each graduate completes a thesis on a current issue facing his/her jurisdiction. These theses often translate into policy and practice. The CHDS is sponsored by the U.S. Department of Homeland Security (DHS), National Preparedness Directorate, within the Federal Emergency Management Agency (FEMA). 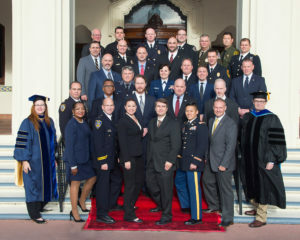 ABOUT NPS: The mission of the Naval Postgraduate School is to provide unique advanced education and research programs in order to increase the combat effectiveness of the U.S. and Allied armed forces as well as enhance the security of the United States. For information, visit www.nps.edu. • Melanie Burnham, Lieutenant Commander, United States Coast Guard, Washington, D.C.
• James Fitzgerald, Special Agent, FBI, Washington, D.C.
• Sheree McManus, Grants Management and Policy Specialist; DHS/FEMA, Washington, D.C.
• Katrina Woodhams, Deputy Director, FEMA HQ Protection and National Preparedness, Washington, D.C.